This is the first moment I've had to sit in almost a month. With the move to our new location at 444 Preston Street, things have been hectic. Not hectic enough though for me (who typically enjoys sleep) to wake up at 5am and watch the Prince say 'I do' to his Princess. My mom always tells the story of her and I when I was only a couple of months old watch the fairytale that was Charles and Diana. So, on April 29th 2011 I sprung out of bed and hopped into my mom's (yes my hubby and I are living with her temporarily as we renovate our new home) to watch THE wedding of the year. Kate looked beautiful, I loved everything about her gown, I thought it was perfect! I loved how her dad held her hand down the aisle, I loved how Kate took William's breath away. I love how they are in love. But... back to the dress!! Rewind to bridal fashion week at the start of April 2011 and you'll see some uncanny resemblances to Kate's gown by celebrated designer Romona Keveza. 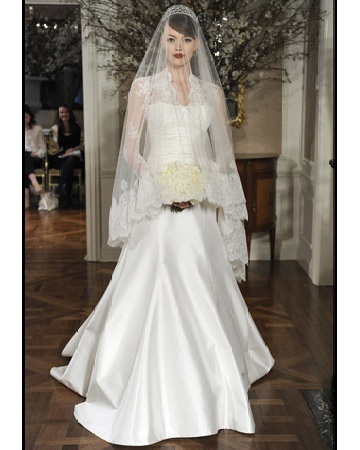 Romona Keveza is known for her sophisticated, elegant and feminine collections. 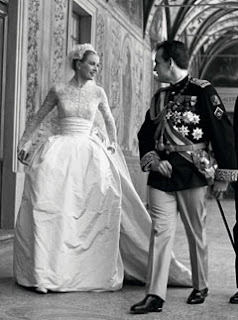 There is a Grace Kelly in all of her gowns and I thought Kate channeled this icon as well. Grace Kelly was beautiful. The gown... timeless! This gown will stand the test of time. Princess Kate was radiant in her gown by Sarah Burton. I loved that although the gown was modest in design, there was a little 'sexiness' with the plunging V neckline. Perfect for a young, confidant Princess! Gown by Romona Keveza, unveiled two weeks before the Royal wedding. Available in store this summer!